Tattoos, nail art, jewelry, and fashion – the newest Mint Museum-organized exhibition, Body Embellishment, explores the most innovative artistic expression in the 21st-century international arenas of body extension, augmentation, and modification. The exhibition will be on view from April 11 through September 6, 2015 at Mint Museum Uptown at Levine Center for the Arts, 500 South Tryon Street in Charlotte. The human impulse to ornament the body is an ancient desire that crosses cultures. Seeking to modify the natural skin and shape of the body, people have created imaginative ways to expand and distort, and add color, pattern, and narrative. Focused on twenty-first century innovators, this exhibition provides a glimpse at inventive designers from around the world who explore the role of the body and its embellishment. Tattoo is one of the trendiest methods of skin decoration today, yet is millennia old. Originally associated with indigenous groups, this radical method of body intervention has become an exalted art form. Nail art — the adornment and extension of fingertips — has evolved dramatically from its ancient origins, and today, nail art is a burgeoning means of aesthetic expression. Studio jewelry explores avant-garde wearable art which utilizes the body as an armature for creative expressions. The body embellished through fashion is examined in an installation by the international design collective threeASFOUR, who have created fashions for Bjork, Lady Gaga, and others. Incorporated into a virtual catwalk environment, their recent fashion creations distort parts of the human silhouette and extend humanitarian content. The exhibition includes approximately 100 objects by artists and designers, also including Naomi Yasuda (whose work has appeared on the nails of Madonna , among others), Stephanie Tamez, Mi-Ah Rödiger, and Nora Fok. It is accompanied by a dynamic interactive digital exhibition catalogue authored by Mint curators, which will be available in the gallery and via mintmuseum.org. The Mint Museum of Craft + Design Board of Directors is lead sponsor of Body Embellishment through their Adopt-A-Design program; major support has also been provided by Mint affiliate The Founders’ Circle Ltd. and US Bancorp. The exhibition media partner is WFAE 90.7fm. A VIP preview party which is open to the public on April 9 at 6:30 p.m. Tickets are $75 apiece, or $50 for museum members ($25 for members of the museum’s leadership giving circle, the Crown Society). A CAD (Contemporary Architecture + Design) lecture by fashion design group threeASFOUR (Gabi Asfour, Angela Donhauser, and Adi Gil) at 3 p.m. on Sunday April 12. Admission is $12 or $5 for Mint members, free to teens and college students with ID. Taste of the Mint: Small plate and beverage pairings at Halcyon, Flavors from the Earth and E2 Emeril’s Eatery restaurants, followed by a guided gallery tour, at 4 p.m. on April 15. Tickets are $50 or $35 for Mint members. Body Embellishment, Body Adornment: Fashion Accessories and Trends: This FREE public talk features local fashion consultants and fashionistas discussing fashion trends. April 15 at 6:30 p.m.
Art Fusion: Embellish: This FREE public event features hands-on activities and gallery tours and one-night-only FREE admission to both Body Embellishment and the Mint’s companion exhibition, Halston and Warhol: Silver and Suede. April 22 from 6-9 p.m.
A CAD lecture by Carlos Rolon (aka Dzine), an installation artist and nail art historian, on May 6 at 6 p.m. Admission is $12 or $5 for Mint members, free to teens and college students with ID. (Please note: The previously scheduled CAD lecture by Mikyoung Kim, which was cancelled in February due to inclement weather, has been rescheduled for Thursday April 16 at 6 p.m. Kim is an architect and designer working on art to be installed at the UNC Charlotte station of the CATS Blue Line light rail extension). The exhibition will be featured at the unprecedented new event The Amazing Taste: A Progressive Dinner at Levine Center for the Arts on May 18 at 5:30 p.m. This fundraiser features appetizers and gallery tours at the Harvey B. Gantt Center for African-American Arts + Culture, entrees and Body Embellishment gallery tours at Mint Museum Uptown, and dessert, coffee, and performance at Blumenthal Performing Arts’ Knight Theater. Tickets are $120, with discounts for members of the three participating institutions. A master artist workshop with jewelry designer Nora Fok, June 17 from 6-9 p.m. Cost is $100 or $75 for Mint members. Member-only preview hours in April, gallery spotlight tours on select dates in April-June (free after exhibition admission), and FREE design labs and roundtables for teens ages 14-18 with threeASFOUR, Dzine, and Nora Fok in April, May, and June. Teens must register for the Mint’s new NexGen Mint initiative at mintmuseum.org/visit/nexgenmint. Members of the media may preview the exhibition at 10 a.m. on April 9. Light refreshments will be served, and gallery tours and interviews with curators are available. Media photography is permitted and high-resolution images are available upon request. RSVP to leighdyer@mintmuseum.org or meredith.connelly@mintmuseum.org or call 704.337.2018. Above image: Joji Kojima (American and Japanese, 1987-). 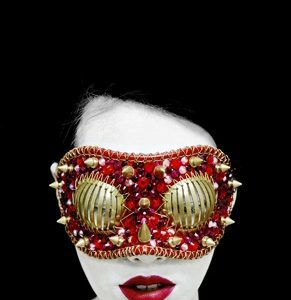 Raspberry mask from Hotel Gluttony Collection, 2011, resin, brass, crystals, leather. Collection of the artist. © Joji Kojima.